The mirror test was developed by psychologist Gordon Gallup Jr.1 in 1970 as a method for determining whether a non-human animal has the ability of self-recognition. It’s also known as the “mark test” or “mirror self-recognition test” (MSR). When conducting the mirror test, scientists place a visual marking on an animal’s body, usually with scentless paints, dyes, or stickers. They then observe what happens when the marked animal is placed in front of a mirror. 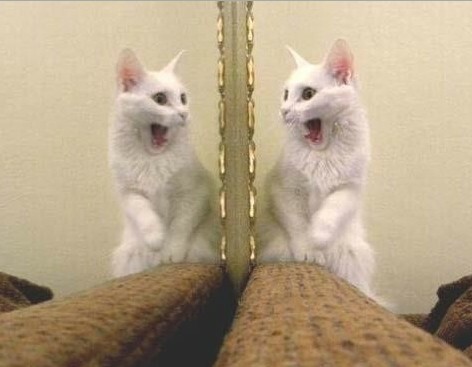 The researchers compare the animal’s reaction to other times when the animal saw itself in the mirror without any markings on its body. Animals that pass the mirror test will typically adjust their positions so that they can get a better look at the new mark on their body, and may even touch it or try to remove it. They usually pay much more attention to the part of their body that bears a new marking. Even if an animal doesn’t pass the test, they may still have interesting reactions to their reflections. Many species respond aggressively, or even show affectionate behavior. In such cases, it might be that the animal mistakes its reflection for another of its kind. This can lead to some amusing sights for human observers. Humans are able to pass the mirror test when they are around 18 months old. But how do other animals fare? Currently, 9 non-human animal species pass the mirror test. Not all individuals of each species pass, but many do. This list of animals that have passed the mirror test examines how each species responded during testing. Bo nobos, chimpanzees, orangutans, and gorillas have all passed the mirror test.4,1,5 However, it isn’t uncommon for many individuals to fail, especially if they are particularly young or old. In chimpanzees, there is evidence for self-recognition in about 75% of young adults.6 This percentage lowers with individuals closer to either end of the age spectrum. Many gorillas have failed the mirror test. When shown a mirror, a number of silverbacks have exhibited aggressive behavior. It has been speculated that most of the gorillas and other primates who do not pass the test may have inhibited behavior due to the presence of observing humans. Additionally, gorillas will often avoid eye contact with their reflection. By avoiding eye contact, gorillas are likely not able to look at their reflection long enough to realize that it is themselves who they are seeing. Koko the gorilla, well known for having learned sign language and performing well in other cognitive experiments, was the first of her species to pass the test. In a study9, orca whales were allowed to view themselves in a mirror. Afterward, they were marked, then allowed to view themselves in the mirror once more. Their behavior showed that they expected the image would be altered as a result of their being marked – a strong indication that they understand the image in the mirror is indeed of themselves. The Eurasian magpie is the first non-mammalian species to pass the mirror test.10 When contrasting colored stickers were placed on their feathers, the magpies reacted to their reflections by trying to remove the mark. Birds who were marked with invisible stickers showed no altered behavior. Prior to this experiment, scientists believed that self-recognition abilities came from the neocortex, a part of the brain found only in mammals. Since magpies are birds, they do not have this part of the brain. 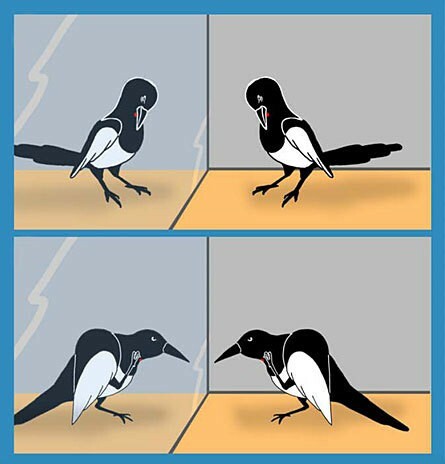 Magpies passing the mirror test shows that the ability of self-recognition can arise from different brain parts in other types of brains. It’s a case of “convergent evolution”. This happens when similar abilities, behaviors, and traits independently evolve in species that are not closely related. The ants were next given a classic mirror test. The team of researchers would use blue dots to mark the clypeus of some of the ants, which is a part of their face near their mouths. When it comes to fish, manta rays have the largest brains. This fact lead Dr. Csilla Ari to suspect that they might be the fish species most likely to pass the mirror test.12, 13 When she exposed captive manta rays to a large mirror, they showed great interest in their reflections. The rays would repeatedly swim in front of the mirror, turning over to show their undersides and moving their fins. When in front of the mirror, they even blew bubbles, an unusual behavior. What the rays didn’t do is try to socially interact with the mirror image. All of this suggests that the rays might recognize it’s themselves they’re seeing in the mirror, not another ray. However, a classic mirror test using marks on the rays’ bodies has yet to be done. If rays can pass a mark test, it’s a more solid indication of self-recognition abilities. The presence of exploratory behavior and a lack of social behavior doesn’t automatically indicate self-recognition. If an animal can pass the mirror test, it’s certainly strong evidence of self-recognition, and indicates the possibility of self-awareness (i.e. a “sense of self”). However, it’s not definitive proof. And if an animal isn’t able to pass, that doesn’t necessarily mean that they do not possess these abilities. For example, animals that rely on other senses more heavily than their vision may not take much interest in the sight of their reflections. Dogs, who recognize others mainly by their sense of smell, might quickly conclude that their mirror image is not of themselves or any other animal, because it lacks a corresponding scent. Furthermore, some animals may be able to recognize themselves in the mirror and see that they have been marked, but do not find the mark important enough to warrant touching or inspection. To learn more about the mirror test and some of the animals that have passed it, view the videos below. 1 – Gordon G. Gallup Jr.
8 – Kenneth Martin, et al. Evidence of self-awareness in the bottlenose dolphin (Tursiops truncatus). 10 – Helmut Prior, et al. Are Ants (Hymenoptera, Formicidae) Capable of Self Recognition?